Redefining corporate law. Targeting the node of enterprise to shift capitalism. Those were some of the thoughts running through Neil Grimmer’s mind as he joined eight other businesses to welcome Benefit Corporations in Delaware in July, 2013. As cofounder and President of Plum Organics – along with a small group of parents – Grimmer’s philosophy has been pretty straightforward: Every kid deserves the best nutrition and no child deserves to go hungry. The result: an organic food line that prioritizes nutrition, environmental conservation, reduced packaging [a supply chain assessment of the traditional glass jar vs. the Plum pouch was undertaken that showed energy consumption for the latter was much less, fossil fuel consumption for their transportation was a ninth, and they’re 14 times less likely to end up in landfills even with aggressive recycling of the glass jars] and an accompanied mission to target child hunger. Sound like a lot to take on? 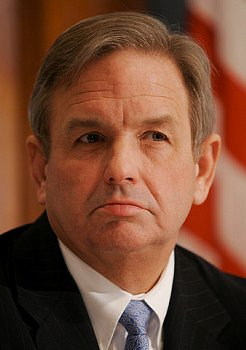 Grimmer’s conviction came from experience. As the former VP of strategy and innovation with Clif Bar, he knew a thing or two about product development that infuses innovation with sustainable practices. “At Clif, I looked at sustainability as a journey, not a method. We’ve adopted that here at Plum,” he says. Plum Organics went from recording $800,000 in sales in its first year  to $93 million in 2012. While the numbers tell their own story, here’s the kicker. Plum Organics is a certified Benefit Corporation. And now with Delaware’s recognition of the legal status, parent company Campbell Soup Company – who announced plans to acquire Plum in May 2013 – becomes the only company in the U.S. with a fully owned subsidiary that is also a Public Benefit Corporation. “Our business success at Plum has been based on creating a great product in a way that respects the highest levels of corporate citizenship. It is actually good business to be a good corporate citizen – and our success speaks to that belief,” says Grimmer. Grimmer is excited – about the notoriety as well as joining hands with an iconic American brand, well-known for its altruistic actions and social causes. “We have a mission centric core: nutrition and solving hunger with our benefit corporation status our secret sauce and innovation driving the entire process. Campbell has a dual mandate: strengthen the core Campbell business while driving new consumers and innovation. It’s a perfect marriage,” he explains. After spending some time with Campbell Soup Company CEO Denise Morrison, Grimmer’s search came to an end. 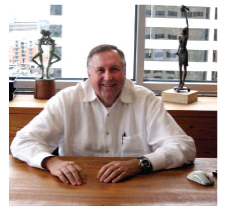 “As our company grew, so did our ability to impact the world,” says Grimmer. And being a benefit corporation meant the added leverage of a model that places impact and profits in the same sentence. Like The Full Effect program, which was launched this year to target 16 million kids who go without daily meals every day. “We now had the scale and capability built into the business to make an impact. So we designed a Super Smoothie jam-packed with nutrients,” he says. So far, Plum has committed to producing and distributing half a million Super Smoothies in 2013. Sound familiar? In 2012, Campbell led a similar one-of-a-kind campaign to produce more than 40,000 jars of “Just Peachy” salsa exclusively for the Food Bank of South Jersey, using fresh, local New Jersey peaches that were not able to be sold because of blemishes but were fine to eat. The initial run from last year’s harvest generated $100,000 for the Food Bank of South Jersey through retail sales. “Plum and Campbell are both consumer-centric companies, and we share a focus on innovation, a critical component of success as we continue to marry our citizenship commitments with the Campbell business model,” responded Dave Stangis, Campbell’s Vice President, Public Affairs and Corporate Responsibility. Clearly, the stars align for the two companies but at the end of the day, Campbell is a public company with shareholders and the pressures of satisfying quarterly balance sheets. Will the acquisition bring along with it the familiar headaches of layoffs, change in management and perhaps even a shift in models? “Plum is a standalone business and will remain so. 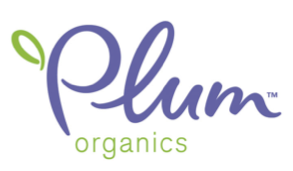 I will continue to lead Plum Organics and our team is staying intact,” says Grimmer, who plans on remaining an active member of the recently established Plum board of directors. The company will also continue to headquarter in California. “We have already begun working with Neil and the Plum team. We are connecting on joint priorities and sharing Campbell’s CSR and sustainability resources,” he added. “We’re looking forward to leveraging Campbell’s capabilities and skills to grow the Plum brand. As we dig into these opportunities, we will also be looking to focus on aligning our public benefit corporation with Campbell’s mission, model and culture. They have such a strong CSR program that the opportunities to target hunger are endless,” Grimmer explained. And this is where Grimmer believes the conversation needs to shift. “There is a new economy emerging of consumers who are looking to purchase from companies with a mission. They’re building a virtuous circle. When consumers support a business, you end up growing quickly with more exposure and higher impact,” he says. Of course, being a public benefit corporation is but one element of Plum Organics’ success. It’s an exciting business story. But the bigger story here is about being able to make an impact by combining a good product with sustainable attributes and an associated social and environmental cause. And that is where Grimmer wants to push his colleagues across corporate America further. Originally written for and published on CSRwire’s Commentary section Talkback on May 1, 2013. 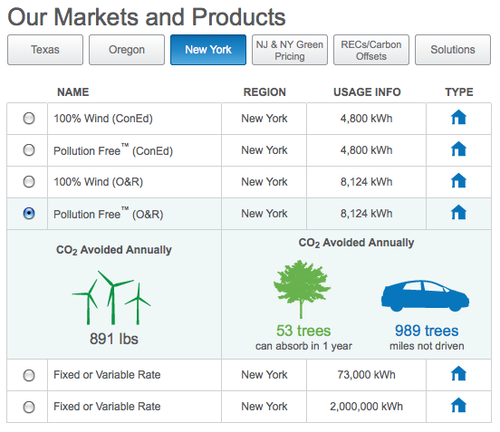 Green Mountain Energy, founded in 1997, is the longest selling retailer of carbon offsets in the country with a lofty mission: To change our dependence on power generation from coal and nuclear energy to renewable sources. With a clear environmental mission and a dedicated consumer base, why would a company like Green Mountain Energy [GME] bother publishing an annual sustainability report? “The [sustainability] report gives us an opportunity to write about everything we are doing. When you build a company of people who are passionate about the environment, the report becomes a forum to talk about everything we are doing,” says former President Paul Thomas. Thomas is referring to the recent acquisition of GME by New Jersey-based NRG Energy. How did the company overcome hesitance from employees, customers and investors alike about the acquisition? “Our society is transforming as a whole from being oil-driven to something very different driven by renewable sources and technology. The question is how do we get from here to there as a society? NRG is a good example [of a company addressing] this dilemma. They are the largest investors in solar production in the country. Now, Green Mountain is a part of their initiative to make NRG a cleaner company – their activities are genuine and we fit well,” he explains. What about shifting work cultures? Thomas says the company has undergone several shifts since the 1990s. “We started with a lot of environmental enthusiasts with a low level of business skills. It would have been a lot of hot air if we didn’t drive value to customers. Today we are also a good sales organization, a customer-service driven company,” he says, transitioning from being an environmental company to a good business. “Remember that in 1997, this was just an idea,” reminds Thomas. “We’ve also increased recycling and all our material now is made from 100% post-consumer recycled content,” he added. GME also expanded its innovative Sun Club, which asks customers to pay an additional $5 a month to help the company invest in solar projects. The money donated is then distributed to fund solar projects nationwide in coordination with nonprofits. 2011 marked the biggest year yet in contributions. But what is sustainability without employee engagement? GME encourages its employees to bike, bus or take the subway in its New York office and participants in 2011 doubled past years’ numbers, according to the report. The report also makes public GME’s paper and publishing standards as well as its contributions and partnerships with organizations like EarthShare. While all is fair game, Thomas admitted that not everyone attends every month. But what it does is allow “us to be transparent. I believe that employees are effective when they have more context of their job and how they are contributing. Their role makes more sense and there is less doubt about how they fit in and how they can make a difference,” he added. With the Rio+20 Summit coming up, I asked Thomas what the government and public policy makers can do to help support the growth of businesses like GME. Originally written for and published on CSRwire’s Commentary section Talkback on June 1, 2011. The real problem with companies today? That’s how Erik Trojian, director of policy for nonprofit B Lab, opened his presentation at the recent seminar held jointly by Georgetown University, the Caux Round Table and the Sustainable Business Network of Washington (SBNOW). The theme of the two-day seminar was weighty: Ethics, Leadership and Sustainability – to explore how the capitalist spirit of free enterprise and social entrepreneurship can help transform economic systems and promote social justice, basic rights, and human freedom around the world. Common among the presentations of the day was a repeated emphasis on corporate governance, beginning with Trojian. Trojian and his team are on a mission: To get all 50 states of the United States of America to sign the benefit corporation legislation into law. So far, they have succeeded in seven states. “The Securities Exchange Commission [SEC] was set up to have more finite control of corporations’ governance. Auditors were expected to act on all suspicions. We convinced the New York Stock Exchange to address disclosure and transparency,” he started. “The Act’s real problem was its uncertainty. They don’t want to deal with figuring out what is a crime and what isn’t resulting in people doing whatever they want to do. Plus the Act was not valid outside the geographic boundaries of the U.S. The rest of the world has no incentive to use this,” he said. Lucy: Asking the hard questions in the board room is essential, and also being willing to be persistent in the pursuit of the best outcome for the company and stakeholders is essential. Those are the kind of independent directors we want in the boardroom. Anyone who is not willing to operate in this new reality doesn’t belong in the boardroom, and as we develop & educate new directors they need to know that this is what shall be expected of them. As directors it is vital that we understand going into the post what our job is inside and outside of the boardroom, what skills and knowledge we bring to the table, and also that we also operate beyond those strict skills we bring to also be able to synthesize data quickly and to make decisions in a well-informed and responsible manner. I believe strongly in term limits. Best practice, as set out in the U.K., is several terms that add up to 9 years, and I think this is correct. There is no way that someone can maintain their independence for much longer than that, and if the board room is to remain a place for dynamic discussion, it is incumbent upon boards to continually refresh themselves so that the people around the table bring a balance of continuity and change and the company is able to keep its finger on the pulse of changing agenda items, be it corporate social responsibility, technology, or anything else that is relevant to continued strength, growth and wellbeing of the organization. If Capitalism Isn’t Bad, Are Capitalists? Readers: It’s your turn to participate in this dialogue and become the change makers you seek from our leaders. How are you solving ethical dilemmas between personal values and professional responsibilities? How do you define personal responsibility – and extend that to corporate responsibility? Originally written for and published on CSRwire’s Commentary sectionTalkback on April 4, 2012. Last week, Ceres and the United Nations came together to host the 2012 Investor Summit on Climate Risk & Energy Solutions in New York City. With several announcements marking the day—a record $260 billion was invested in clean energy in 2011—it was Bank of America Chairman Chad Holliday’s pre-lunch presentation that stood out for its aspirational message. I had the opportunity to host Holliday last year for a keynote on responsible business practices. The occasion: The release of Carol Sanford‘s book The Responsible Business, for which Holliday provided an articulate Foreword. This time around too, Holliday chose to focus on lessons learned from his years leading DuPont, which saw record growth, transition from a chemical company to a science-based products company, as well as the country’s first chief sustainability officer appointment. “Don’t bet against a major breakthrough or a series of breakthroughs that create clean, cheap energy.” Holliday followed this warning by a reminder that “the price of natural gas in the Middle East” used to be our prime concern. “What we see in the press is that China is overtaking us in engineering. In fact, there is no question that China is indeed leading us in the number of graduating engineers. But when it comes to quality and diversity—biotechnology, nanotechnology, quality control, systems engineering—we are hands down champions,” Holliday said. His message: That’s opportunity to deliver value for business, investors and entrepreneurs. “One nuclear fallout after the tsunami that struck Japan was enough to compel Germany to take the decision to go completely nuclear-free for their energy supply,” he said. Originally written for and published on CSRwire’s Commentary section Talkback on January 18, 2012. These were just some of the things that kept us busy in 2011. While some represent the changing marketplace, others are age-old struggles between activists, consumers, employees and corporations. Yet, they all represented the emergence of new forces at play in our corporate corridors. Yes, 2011 represented despair for many – the jobseekers, the underemployed, the single parent, the shopper, the CEO, the trader – but with despair, as CSRwire’s CEO Joe Sibilia noted, comes hope, adaptability and often, solutions. And it is at that stage that most of us converged in 2011. Take, for example, the recent BSR conference held in San Francisco. My panel addressed a topic that is bound to get most of us shifting in our chairs: Sustainability in a Hyper-Transparent World. Ouch, right? Joined by executives from Oxfam, Intel and SourceMap, the conversation included several uncomfortable moments (I offered up Zappos as an example to the audience, citing that the company livestreams its all hands meeting in order to live its mission of “building open and honest communications.”) and featured several probabilities, suggestions, and potential solutions by a group that included lawyers, sustainability executives, CSR officers, reporters, strategists, entrepreneurs as well as nonprofit leaders. That the panel attracted a full room of senior executives willing to discuss difficult issues like privacy, corporate governance and stakeholder responsibility is a start. Till last year, while much was being written about CSR and sustainability, executives were largely absent from the dialogue. In 2011, this changed ever so subtly. Earlier in the year, Best Buy CEO Brian Dunn took the stage at one of the year’s most prolific conferences, the Boston College Center for Corporate Citizenship’s annual conference. He discussed the importance of employee wellbeing, organizational design, transparency (Kathleen Edmond was the first Chief Ethics Officer to start a blog on ethical issues in the workplace) and the importance of stakeholder engagement. At Net Impact, Nike’s Hannah Jones took the stage as did REI CEO Sally Jewell. BSR kept the momentum going by featuring Ofra Strauss, CEO of the Strauss Group, Autodesk CEO Carl Bass and Anheuser-Busch CEO Carlos Brito. These chiefs weren’t exactly looking to gain brownie points. They were after all speaking to the choir in some respects and to an audience that for the most part, gets business and social responsibility. But what made each of them stand out was their honesty about the difficult problems facing us today – a first? – agreement on the role of business in adding to today’s social and environmental mess. Mea culpa, they all said. Followed by: Here’s how we are trying to change ways, rethink growth, repurpose missions and reengage stakeholders. Despite all the naysayers of social media, there is no denying that for any organization that sells a product or service today, having a dedicated presence on Facebook and Twitter is a prerequisite. With engagement reaching never-seen-before proportions, even Chief Sustainability Officers are learning to communicate in 140 characters or less. But several companies dipped their toes in active engagement by trying out new formulae: Best Buy released their annual CSR report by hosting a live webinar (that I moderated) with their Sustainability team and a parallel conversation on Twitter. As I quizzed them about the report, questions poured in from Twitter: What was Best Buy doing in the area of conflict minerals? What about human rights? Recycling? How about consumer education? And why the low diversity ratio of employees? Squirm they did, admitting that the issues were complex they did, but answer they also did. They weren’t the only ones though. Timberland (that was acquired by VF earlier in the year) launched their new Communications portal, McDonald’s hosted a live chat on Twitter with VP of CSR Bob Langert, UPS held several chats during the holiday season from sustainable gifting to green packaging choices. Communicating your sustainability story is an important cog in the wheel called trust and the choice to engage is no longer a valid option. How you choose to do so, however, will continue to differentiate you from your competitor. Several large organizations came forward in 2011 asking jobseekers and students applying for jobs in sustainability and CSR to understand how to relate their core competencies and knowledge to the issues facing us today, i.e., water depletion, carbon emissions, climate change, etc. How can depleting levels of water relate to a professional services firm, for example, or a bank? Why must a software company invest in engaging and educating its supply chain? The Environmental Defense Fund’s Climate Corps program is one of very few initiatives that have managed to tie sustainability with business strategy and growth while creating jobs out of the process. From placing seven MBA candidates as summer fellows in 2008, the program has quickly grown in popularity, placing 96 students at 78 companies in 2011. The fellows spend an entire summer working with their host companies on identifying energy efficiency solutions, implementing carbon management processes and helping diverse businesses embed environmental sustainability into their strategies. The results: Millions in savings. While few get direct job offers from the Fellowship, most have had success finding jobs where their unique mix of experience, passion, and the ability to tie business strategy with sustainability, is appreciated and utilized in changing processes, setting standards and adapting organizations to a fast-changing reality of limited resources. Where does sustainability fit in your organization? Everywhere, really, is the only correct answer, irrespective of where the chief sustainability officer sits. This, finally is getting addressed by what I consider a crucial component at any company: The HR and recruitment teams. In collaboration with IE Business School, I moderated seminars with recruiters, HR directors and organization design consultants on the value of CSR in candidate recruitment and retention. We discussed the relationship between productivity, values, respect and growth. We heard from students who want to work for socially responsible companies and executives who are redirecting their organizations to instill a culture of ethics, responsibility, accountability and pride. Mea culpa, most of them said. That’s a start. Originally written for and published on CSRwire’s Commentary section Talkback on December 30, 2011. That was the focus of one of the panels at Net Impact 2011 featuring Avon’s VP of Sustainability and Corporate Responsibility, Tod Arbogast; LinkedIn’s Head of Employment, Branding and Community, Meg Garlinghouse; and Jones Lang LaSalle’s SVP of Sustainability Strategy, Michael Jordan. Representing companies that are often called out for their out of the box thinking on social responsibility and sustainability, the speakers discussed a range of topics including the always debatable definition of corporate social responsiblity, measuring employee engagement as well as the skill sets that go into the makings of a CSR director. Jordan picked up where Garlinghouse left off adding that businesses must leverage engaged employees and identify champions early on for successful CSR programs. “CSR has a direct tie-in with our business. After you’ve built the business case and identified regional champions, work together on identifying and building in efficiencies,” he advised. “Build friendships, be seen as pragmatic and capture early wins. Then leverage those to go further and faster,” Arbogast said. But how do you measure the efficacy of employee engagement? A survey I conducted a few months ago with Smartbrief on Sustainability asked whether companies were measuring employee engagement on CSR. With over 70 percent of respondents saying they did not measure employee engagement, how were these panelists identifying wins and scale? Once again, there was a healthy difference of opinion across the panel. While Garlinghouse emphasized company mission, the other two focused on operational procedures and policies. “We recruit on the notion of social impact. These conversations happen during the interview process,” Garlinghouse alluded, noting LinkedIn’s entire modus operandi is based on “creating economic opportunities.” LinkedIn also offers employees the opportunity to do whatever they feel passionate about one Friday a month. “They have to come to work but they can pursue whatever they are interested in,” she said. “For us, measuring the progress of your platform from awareness to implementation to operational strategy has always been key,” added Jordan. Responding to an audience question about resourcing for CSR initiatives, Jordan emphasized that most of Jones Lang LaSalle’s sustainability activities have been client-driven. “There is a clear business case because our clients are demanding sustainability strategies,” he said. For Garlinghouse, employees have been the most forthcoming about corporate social responsibility initiatives. “Our CEO is very involved. Also, our employees are really committed to our company mission,” she said. People’s Person: Know how to communicate with people from all kinds of backgrounds and perspectives. Conflict Resolution: You must be a skilled mediator. Know that business cases will vary from group to group and you must be willing and diplomatic enough to finesse the tension lines and bring about resolution. Business Pragmatism: You must be a realist and know the business inside out. For CSR and sustainability programs to be effective, you need to understand what drives decisions and action. Originally written for and published on CSRwire’s Commentary section Talkback on November 9, 2011. Translating Business Responsibility: An interview with Warner Bros. CEO & Chairman Barry Meyer: Now LIVE on CSRwire! When the Justice League comes together to fight evil, evil stands little chance. In a world of economic uncertainty and social unrest, superheroes provide children with mentors, entrepreneurs with lessons in responsibility, and the rest of us with inspiration. Now, DC Entertainment has joined hands with Time Warner and Warner Bros. to launch We Can Be Heroes. Their target: The hunger crisis in the Horn of Africa. Join CSRwire’s Editorial Director Aman Singh in conversation with Stephen Jordan, Executive Director of the U.S. Chamber Business Civic Leadership Center and a group of MBA graduates virtually for an intimate conversation about what happened in corporate social responsibility (CSR) in 2011 and what the field has in store for 2012. Register for the FREE live stream and join the tweetchat at #BCLConCSR! The 2012 CSR Outlook is the first in a FREE six-part forum series being conducted by the Center. The U.S. Chamber BCLC’s Conversations with Stephen series is produced and moderated by founder and executive director Stephen Jordan. Guests engage in thoughtful, solution-oriented discussions and debates about the CSR field. The six-part 2012 series is offered at no charge as part of BCLC’s commitment to share knowledge and best practices with current and upcoming CSR practitioners. We look forward to hearing from all of you @AmanSinghCSR, @CSRwire and #CSRwire or #BCLConCSR! 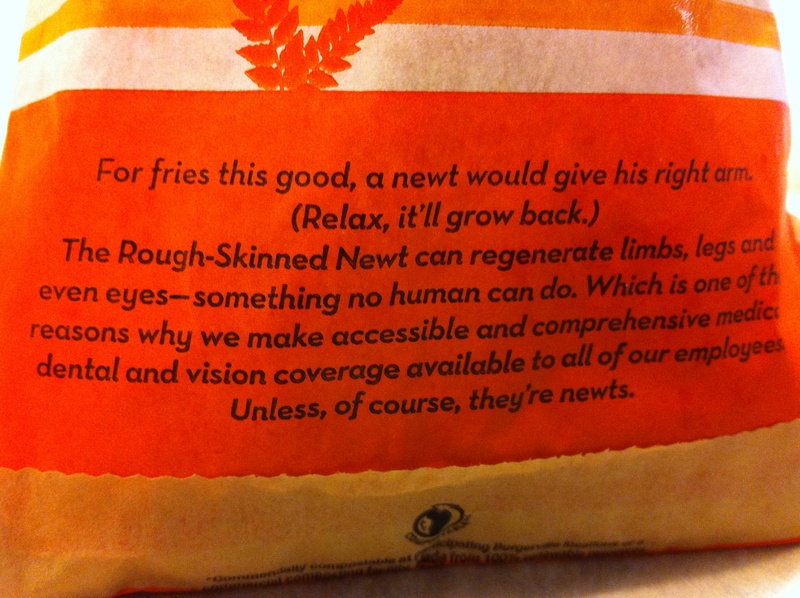 A bag of sweet potato fries at Burgerville in Portland, Oregon: Social messaging done right?